Bobby Flay is the ultimate New Yorker. But transport him to Kentucky, where he owns Thoroughbred racehorses, and he seems even more at home. Here, his story and his feel-good food. 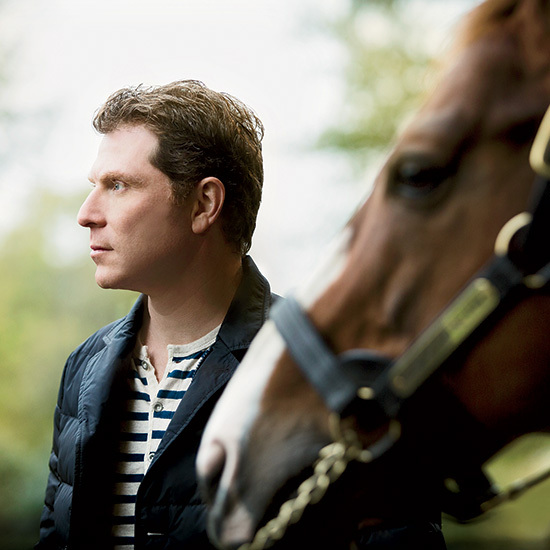 When I was 17 years old, I dropped out of high school and got a job working the salad station at Joe Allen in the Theater District," Bobby Flay says on a misty, raw morning in Kentucky, looking around at bluegrass pastures that couldn't be any farther from that restaurant in midtown Manhattan. He is stroking the nose of the Thoroughbred stallion Giant's Causeway inside one of the immaculate gable-roofed bluestone barns that make up the Ashford Stud farm in Versailles, just outside Lexington. "A couple years before that," Flay continues, "my grandfather took me upstate to Saratoga Springs for the first time. I wasn't into riding—look, I was a city kid—but I just loved the races. I always thought it would be fun to own a small piece of a horse one day." In the 30 years since, Flay has not only become one of the most recognized chefs in America, he has also become an investor in several racehorses. Horse racing is big business, and Ashford is one of the sport's top farms. At the peak of the market, in 2008, Giant's Causeway was one of the highest-earning studs in racing history, siring two of Flay's horses now in training—including one, Sophie's Style, that Flay named after his teenage daughter. Flay has owned high-earning horses—his filly More Than Real won one of the prestigious Breeders' Cup races in 2010—but for him, money is not the draw. "When I was finally old enough to make that first risky investment"—about 15 years ago—"I realized I liked the Thoroughbred business so much more than the racing business. There's nothing like watching the horses exercise just after dawn, when it's perfectly quiet except for the thundering of their hooves." These days, he visits Lexington about six times a year to check in on his horses, to visit the stud farms where the matchmaking gets done and to watch the races. And although Flay has long been a fan of Southern food, becoming part of the racing community in Lexington has deepened his culinary knowledge. He's found inspiration in iconic bluegrass foods—mutton barbecue, fried chicken—and he knows where to find the best sausage-and-egg biscuit at the Lexington Farmers' Market, too. "I love it here," he says. "I love visiting the horses, I love the idea of growing families of horses." Which is how this city-kid–turned–Iron Chef has ended up at Ashford cooking Kentucky-inspired dishes with trademark Flay flourishes and innovations. Back in the sprawling farmhouse-like building that serves as the stud farm's headquarters, Flay straps on an apron and gets to work in the spacious kitchen. There is a lamb shoulder rubbed with ground spices, including ancho chile, coriander and allspice—Flay's own take on the mutton barbecue in Owensboro, Kentucky. Earlier, he had fired up a Big Green Egg (the thick-walled ceramic cooker with a cult following), placed the lamb inside and shut the lid. Back inside the kitchen, he whips up a batch of black pepper biscuits, providing running commentary on the technique as he mixes cold butter into flour with his hands. "Once you add the buttermilk, quit mixing as soon as the dough comes together," he says. "Overmixing creates biscuits that aren't tender and flaky." He pats the dough into a rectangle, cuts it into squares and places them far apart on a baking sheet: "Biscuits need room; otherwise they're gonna steam and won't develop a crust." He brushes each biscuit with buttermilk—for browning—sprinkles coarse black pepper on top and slides the sheet in the oven. "I may truly be a Southerner—genetically, I mean," he says, laughing. "I have the food of the South in my blood." Just then, a hale man with a shock of silver hair and a ruddy complexion walks into the kitchen. It is Charlie O'Connor, Ashford's director of sales. He shakes Flay's hand and says in a thundering Irish brogue, "It smells good in here—you're making us starve." And then: "Did you go to the sale [the racehorse auction] at Tattersalls, Bobby?" "Nope, didn't make it," Flay replies. They swap barn talk, and then it's time to make the fried chicken with honey mustard. Flay's latest take on the South's iconic poultry dish might raise eyebrows in Lexington, but he has thought it through. "The problem with fried chicken is scorching the crust before the meat's fully cooked," he says. "With this recipe, you bake it three-quarters of the way, so the only thing you're thinking when you fry is getting a perfect, golden, crispy crust." After feeding the folks at Ashford, Flay has an appointment with the Woodford Reserve distillery, just four miles down a winding country lane. During his time in Kentucky, he has become passionate about bourbon, and he offers a selection of his favorites at his restaurants. Settled into a streamside tasting room at Woodford Reserve, Flay stares down at 14 glasses set on a grid in front of him. Under the guidance of Todd Roe, the jovial, Kentucky-born plant manager, and Marianne Eaves, a serious young master-taster-in-training, Flay will be trying eight different barrels of bourbon, parsing their personalities and quirks and composing a proprietary blend of two of them—50 gallons, more or less—that will be bottled and offered for sale only at Flay's New York City flagship, Bar Americain. Before the first pour, Flay observes, "It's remarkable to be composing blends and flavors with just one ingredient; I'm always putting six different ingredients together on a plate." But this tasting is far from easy—at 136 proof and above, which is full-barrel strength, the bourbons almost hide their flavors under the heat of the alcohol. Roe calls out apricots and Eaves finds citrus and peaches, but Flay looks for a more personal connection to the experience. "This one knocks on your door—it tells you, 'I'm here!' " he says. "Nuttiness is there. I like big flavor, so I like that." After tasting through all the candidates, Flay picks two barrels, and the blending process begins, with Roe combining all the possible permutations with enough water to bring the whiskey somewhere closer to the more palatable bottling proof of 90.4. Flay ends up selecting Batch E, a blend of barrels three and five, with a swelling sweetness and hints of citrus and butterscotch: well-balanced and bold at the same time. The next day dawns bright, crystal clear and chilly, and Flay heads out on Versailles Road, passing horse farms on his way to Keeneland, a racetrack that dates to 1936. He moves around the grounds with authority, like the Thoroughbred owner that he is, checking in on the action in the saddling backfield before the race. As the horses move toward the track, Flay moves, too, to get in the line at the concessions under the stands for a bowl of burgoo, that ruddy Kentucky stew of potatoes, corn, tomatoes and, well, some kind of meat. As he reaches the head of the line, a commotion breaks out among the counter ladies, who squeal with glee and click off some pictures on their phones as the star chef smiles gamely. He tucks into his bowl of stew and tells them, "This is some good burgoo—and I know something about burgoo." Though he has prime tickets to a shaded box seat upstairs, when the bugler calls the next race, Flay makes his way through the standing-room audience to get closer to the action. For a moment, he is lost in the crowd. Then he appears again, looking down the track at the horses filing in, a 17-year-old Saratoga railbird once again. Matt Lee and Ted Lee are the authors of The Lee Bros. Charleston Kitchen, their third cookbook.